This is a lower body & AB Circuit workout that will have you burning fat all day long. 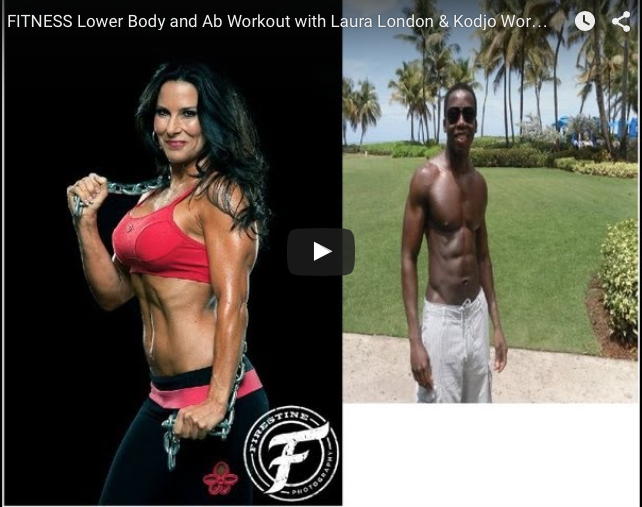 Kodjo and I met on YouTube and we wanted to create a workout together. But he lives in New York and I live in Florida. We came up with this great workout and we each filmed our own parts and then we put the workout video together. I know you are going to love seeing the palm trees and the New York skyline while working out with us in this video. Everyone loved our first crossover YouTube HIIT Full Body Workout that we are back in action for Part Two! If you have a gym boss timer set it for 30 second intervals and get ready to sweat. This is an advanced workout and you are going to need a lot of energy. All you need for todays workout is a mat and a bottle of water. Always make sure to warm up for a minimum of 5 minutes before starting your workout. Here is a great stretching series I like to do before or after my workouts. Need a GYM BOSS TIMER? The gym boss timer is one of my favorite fitness tools. You can set the timer for different intervals depending on your workout and what you want to accomplish. It’s a great way to keep you motivated and pushing hard through your workout. Plus they come in all different colors. I keep one at home and one in my gym bag.